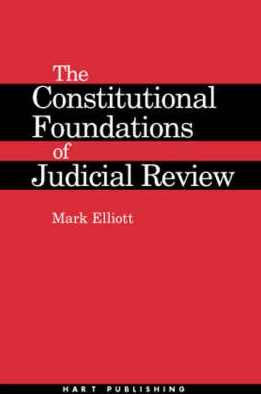 The Constitutional Foundations of Judicial Review was published in 2000 by Hart Publishing. It is based on doctoral research carried out at the University of Cambridge in the late 1990s under the supervision of Professor Christopher Forsyth, for which Mark was subsequently awarded the University of Cambridge Law Faculty's Yorke Prize for a PhD thesis of exceptional quality, which makes a substantial contribution to its relevant field of legal knowledge. The book examines and contribute to the debate concerning the constitutional justification for judicial review of administrative action. In particular, the book explores what it is, in the absence of a written constitution, that provides the source of the courts' authority to intervene in relation to – and to strike down – the decisions and actions of the executive branch of government. The PhD research on which this book draws was conducted at a time when a vibrant debate was going on in this area amongst public-law scholars. Opinion was very sharply divided between accounts of judicial review based upon the ultra vires doctrine (according to which courts merely ensure that administrators observe legislatively-stipulated limits upon their powers) and the common law theory (which holds that the principles of good administration enforced via judicial review are simply common law rules). In the book, these competing claims are evaluated. Both are found to be wanting. It is argued that neither is capable of furnishing an account of judicial review that is both adequately sensitive to the doctrine of legislative supremacy and convincing as to the normative basis of the grounds of judicial review. The book goes on to develop a theory of judicial review rooted in the idea that the role of the courts under the British constitution is to uphold the rule of law in a way and to an extent that is compatible with constraints upon their authority deriving from considerations of separation of powers and parliamentary sovereignty. The result, it is argued, is that the principles of judicial review (at least when applied to the exercise of powers granted by statute) are interpretative, rule-of-law-based constructs that are difficult but (for as long as the supremacy of Parliament is acknowledged) not impossible to displace. Viewing judicial review in this way, it is contended, provides the best way of reconciling constitutional orthodoxy with the practical reality – and normative imperative – of the courts' contemporary supervisory jurisdiction.